Thank you Stonyfield Organics and Justin’s for sponsoring today’s post! As always, all opinions are my own. Summer is not quite over, which means we can still all indulge in some more frozen treats! 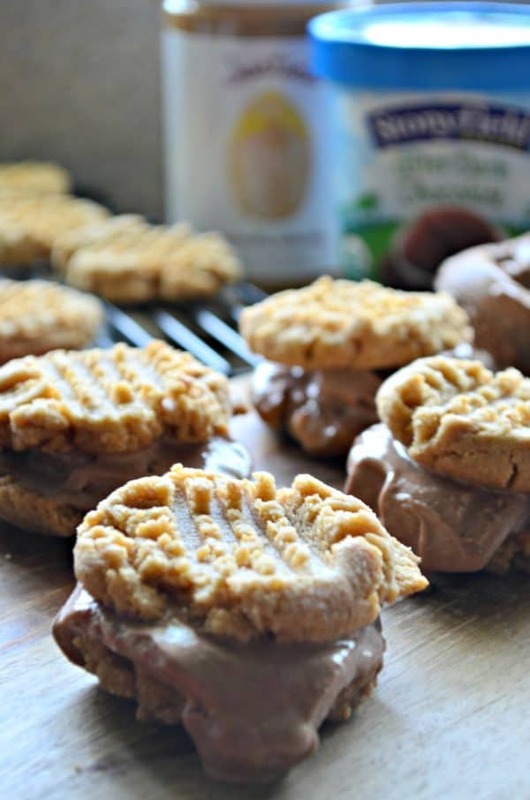 I’m so excited to share my recipe for Peanut Butter Chocolate Frozen Yogurt Cookie Sandwiches! It’s a mouthful both the title and the actual recipe. So so delicious and easy to make! You can even get the kids involved if you choose too! To make this recipe you’ll want to start by baking peanut butter cookies. I grew up making peanut butter cookies and with just 3 simple ingredients; the star, being Justin’s Honey Peanut Butter, these cookies are sure to be a family favorite. Best of all, they are gluten free! So you can still enjoy the same delicious frozen treat with out the gluten! Let them cool and while they cool, you can begin to thaw a pint of Stonyfield Organic After Dark Chocolate Frozen Yogurt! Yes, you read that correct. Stonyfield also sells frozen yogurt. I feel like this is a well kept secret and it’s time to share with the world that you can also get frozen yogurt from Stonyfield! Of course if making this recipe in one day isn’t up your alley, you can make the cookies the night before you want to serve this frozen treat to family and friends! Now as for scooping the ice cream on to the cookies you can literally scoop a little thawed frozen yogurt on to the bottom of a cookie then top with another cookie and eat immediately. Or, my friend Julie, shares a “cool” way to get perfect crisp ice cream lines making it look like the ice cream cookie sandwiches you buy at the store. Either way works just fine the process is just a little different! 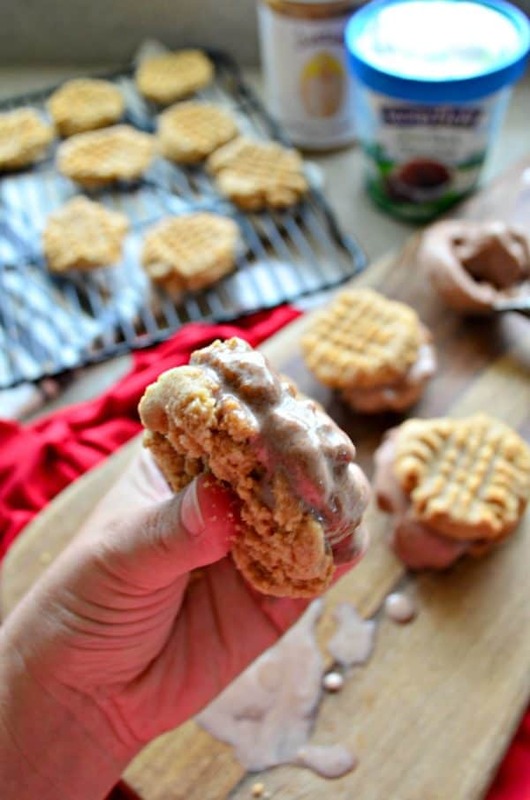 If your entertaining this Labor Day or simply craving a sweet frozen treat I invite you to try my recipe for Peanut Butter Chocolate Frozen Yogurt Cookie Sandwiches! In a stand mixer fitted with a paddle attachment, combine the Justin's Honey Peanut Butter, granulated sugar, and egg. Mix until smooth. Line a baking sheet with parchment paper and spoon cookies on to baking sheet. Using a fork, press the cookies down to form a disc shape. Bake for 7 minutes then remove from the oven. Let the cookies sit on the cookie sheet for 5 minutes, then carefully remove the cookies and let fully cool on a wire rack. 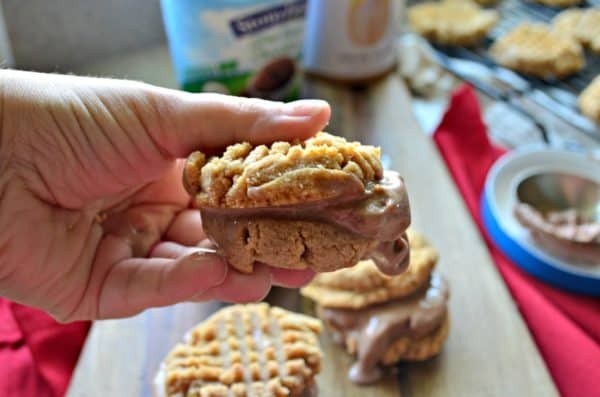 Once cookies are cooled, scoop Stonyfield Organic After Dark Chocolate Frozen Yogurt on to the bottom of one peanut butter cookie then sandwich another cookie on top. Repeat until all your cookies are used! WOW! What a great summer treat! 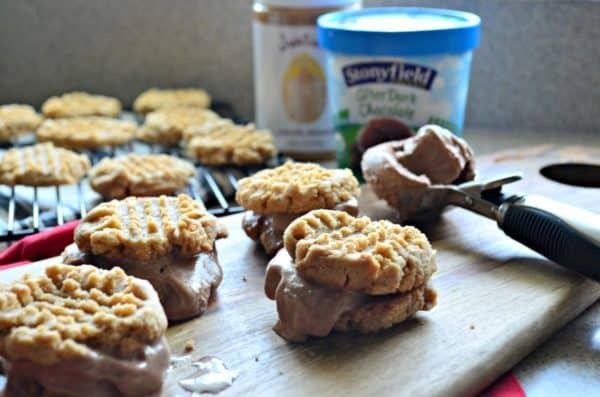 I love how you incorporated the Justin’s into the cookies for these ice cream sandwiches! Thanks Carrie! Yes and an easy summer treat, too! such a deliciously genius way to use froyo!!! Thank you! Yes–you don’t normally think to use froyo paired with cookies but it’s so good!